Home › Toys › Rock-A-Stack Miniature Edition- Pocket Sized Stacking Ring Toy That Really Wo..
Rock-A-Stack Miniature Edition- Pocket Sized Stacking Ring Toy That Really Wo..
Rock-a-Stack Miniature Edition- Pocket Sized Stacking Ring Toy that Really Works! Includes 6 different adorable stacking rings that can actually be removed and restacked! Stacking ring colors include: red, orange, yellow, green, blue, and purple. Stack the rainbow rings from biggest to smallest- they're cute and captivating! 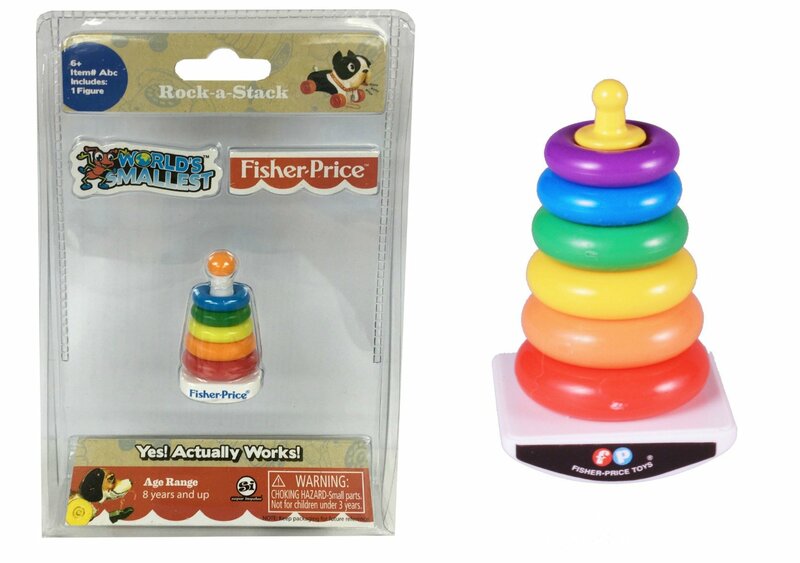 This Miniature edition of the Rock-a-Stack is not only adorable, but thepocket sized stacking ring toy is fully functional! World's Smallest presentsa mini-sized version of the Fisher Price original that is only 2.25" tall and1.5" wide- though the size downgraded, it just became that much more fun! TheWorld's Smallest Rock-a-Stack includes six removable, rainbow rings you canstack by size. Not only could this be a great collectible, but these cutestacking rings still provide as much entertainment as the original version.